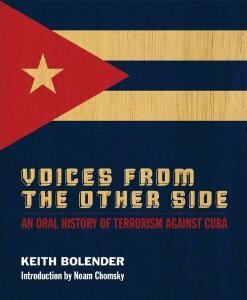 Introduced by Noam Chomsky, Bolender's book is first and foremost a moving "testimonio" of some of the thousands of Cubans affected by the relatively unknown terrorist war waged on Cuba since the Revolution. Through their words, we grasp their half-century of endurance of every conceivable form of terrorism and learn about Cuba's counter-measures. The personal toll of this hidden war has been calculated at 3,478 dead and 2,099 injured. Voices from the Other Side helps us understand the jumble of contradictions that is Cuba and provides a unique resource for anyone interested in Cuba's troubled relationship with the US. Published by Pluto Press, London, Voices from the Other Side will be available for purchase. Keith Bolender is a freelance journalist living in Toronto who has written extensively on Cuban matters for a variety of North American publications, including the Toronto Star, Florida Sun Sentinel, Chicago Tribune, the Council for Hemispheric Affairs, North American Council on Latin America, North American Congress on Latin America, Cuba Now, Progreso Weekly and others. He is a member of the Institute for Public Accuracy (IPA) on their Roster of Experts for Cuban Affairs. Since 1996 he has lectured at the University of Toronto School of Continuing Studies on American Foreign Policy and on the Cuban Revolution. From 1996 to 2002, he conducted dozens of lectures across United States on American-Cuban relations in the context of Americans traveling to Cuba.